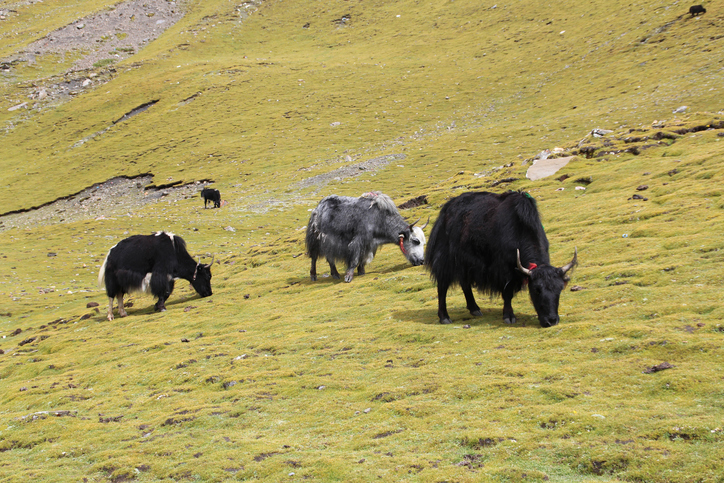 Yaks were grazing in the mountain pastures. The travelers' bags were strapped onto yaks for the journey. When I'm on the phone with my best friend, we can yak for hours. The teacher was sick of all the yak in her class and told the students to work in silence. Yak, meaning ‘wild ox of Central Asia,’ dates back to the late 18th century. It came into English from the French, but of course originated in the Tibetan g-yag or gyag, meaning ‘male yak.’ The slang verb yak or yack, meaning ‘to chatter idly,’ dates back to the 1930s, though the original US slang meant to laugh. It only started being used as a slang word for talk in the 1950s. It is probably a shortened form of yakety-yaking, and linguists believe its origin is an imitation of the sound of laughter and chatter. The noun comes from the verb, and appeared soon after the verb.